This page contains all the information available for Qwilfish in Pokemon Ultra Sun and Moon including all Level Up, TM, Egg, and Tutor moves. Swift Swim Boosts the Pokémon’s Speed stat in rain. Intimidate The Pokémon intimidates opposing Pokémon upon entering battle, lowering their Attack stat. 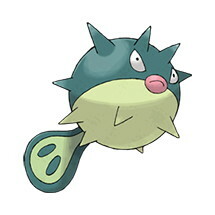 Qwilfish does not have any evolutions.